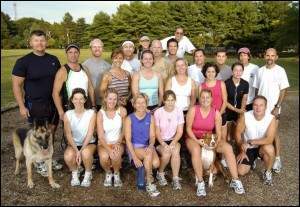 The Rebel Runners were featured in this article in the September 26, 2007 Wilmington News Journal. Inspired by a sequence of member weddings, Cecily Cairns, the staff reporter, described what makes the group special. The article appeared a few days before Brownie and LoJack hosted a 5K race on the morning of their wedding day. Every letter in the Rebel Runners' acronymic moniker designates some defining characteristic of the Delcastle-based training club. It's honest, if slightly uncouth: Run well; Eat crap; Beer-drinking; Energetic; Laughing; Rebellious; Unique; No-; Nonsense; Enthusiastic; Runner. Four years into its existence, the club may want to weave an "M" into that verbal storm -- matrimony, after all, has become steady fare for the group. On Saturday, the club will watch its sixth duo of members marry, and the couple count will hop to seven when another pair makes it official Oct. 20. "None of the couples knew each other before," said Michael Brown, whose marriage to fellow member Laurie Jackson will follow a "Wedding Day 5K" at Bellevue State Park on Saturday morning. "Every single one of us has met in the Rebels. "The more we talked about it in the running group, we were like, 'This is better than eHarmony.' It was just kind of the running joke." It has kept the club's roughly 25 regulars running to -- and, on one occasion, in -- a lot of different ceremonies. While Brown and Jackson will become the first of the group to hold an organized running event on the day of their wedding, it won't be the first striding start to a Rebel Runner union. Rich and Trish Szymanski had their June 28 ceremony at Delcastle Recreation Area -- where the Rebels meet to train every Thursday -- complete with a few pre-vow laps around the park. "I didn't want a big, traditional wedding. I just wanted to do something fun with all my friends who are important to me," said Rich Szymanski, who came up with the idea when he learned Trish's sister would be in town from Washington state that weekend. "He just said, 'How about we get married at Delcastle Rec?' " Trish Szymanski said. "So, we did." After a quick change of attire, the Rebels watched their pals make it official -- sweat, tears and all. "The girls put on boas; the guys put on ties. ... We're all used to changing in cars," Trish Szymanski said. "The only difference was, I put on a white dress." While running has worked its way into some of their weddings, the club's connection is about much more than sport alone. "We're together three or four times a week, not only for running but for social events," Brown said. "I've never encountered a group of people that give each other so much support -- not just in the running aspect, but friendship support. "It's not competitive. I think that's the magic of the Rebels. You've got a lot of compassionate people who really care a lot about each other." That a few of them have paired off doesn't change much, other than a bit of the group's demographic profile. "It used to be more of a singles running group; now, it's more of a married group," Rich Szymanski said with a laugh. Whether it's getting hitched or simply sharing a drink, the Rebel Runners continue to click on the same level they have since the club's creation in late 2003. "It's like an extended family. I found so many close friends, and a husband," Trish Szymanski said. "It was just an instant feeling of belonging. It's like friends you're going to have for life, you just know it."